Improve your self confidence, become more outgoing and demonstrate a stronger proactive approach by using our powerful program. When you think about it, confidence is the one thing that has everything to do with almost everything that happens in your life. From getting that job promotion and making important decisions to meeting that special someone, it is difficult to make good decisions and have a good sense of judgment without a solid confidence level. What is even worse is that a lack of confidence can hold you back from accomplishing your goals and dreams, it can prevent you from acquiring everything you deserve in life, and it can ruin you chance to take advantage of opportunities that may have otherwise been a perfect fit for you. 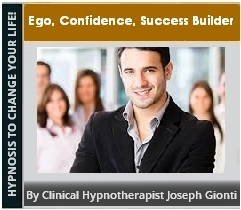 Whether you have always suffered from a lack of confidence or maybe something has happened in your life to diminish it, the good news is you can boost your confidence and self-esteem with the power of our hypnosis program - beginning today!